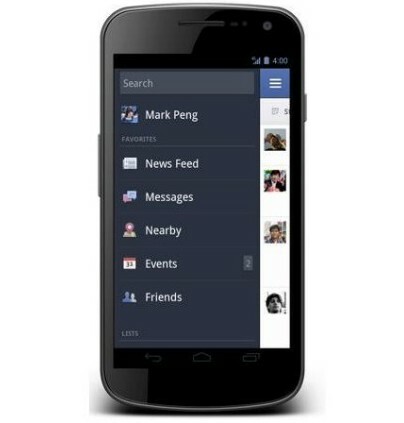 Facebook has recently refreshes its Android app. The updated app comes with an entirely new menu, enhanced photo capabilities and repositioned buttons. The Product Manager at Facebook Keith Peiris stated in a blog post that the latest version is much faster and simpler. According to post, the refreshed version makes photos and albums “up to two times faster.” Moreover, the latest version offers a simple and easy way to share photos, edit captions and read comments. The new Android app also receives a new left-hand menu to prevent users to go back to the main menu to navigate through different options. Facebook has also shifted the notifications and messages button on the top of the app, which were previously present in the main menu. According to reports, the update will soon be available for download in the Android Market. In addition to Android app, there are rumors suggesting that Facebook is going to release a standalone Places app known as ‘Nearby’ as well. Prior to this, the world’s largest social network has already released a standalone app for sending messages and texts in the form of Facebook Messenger. It was released back in August after Facebook’s acquisition of group-messaging app Beluga. Facebook has recently acquired Gowalla that will further help accelerate the development of any Places app that was in the pipeline. The acquisition of Gowalla by social network is to get its assistance in developing different features, such as Timeline. Facebook has no intentions to get hold of its location-based technology. The team at Gowalla will however assist the team in Facebook camp to help developing its standalone Places app. Enjoyed this article? Submit your email to receive daily news and updates. ***You must click confirmation link sent in email. If you don't see the email, check spam folder. Founded in 2009, TechReaders is the source for news in social and digital media, technology and web culture. With more than 200,000 monthly page views, TechReaders is one of the fastest growing technology platforms. There are variety of topics for web enthusiasts. TechReaders provides web news, analysis of trends, review new Web sites and services, and offers social media resources and guides. © 2019 Tech Readers. Reproduction without explicit permission is prohibited. All Rights Reserved. XHTML / CSS Valid.